Rotary blister and tray heat sealer designed for sealing medical packaging such as conventional carded blister packs, medical or pharmaceutical tray packages utilizing Tyvek, foil, thin plastic, laminated film stock, etc. Easy accessibility, spacious work stations and reliability. Locating pins allow the use of quick change seal tools. • Relieved hot plate tooling, to seal only the blister flange, is available. • platen guard is standard on every machine. 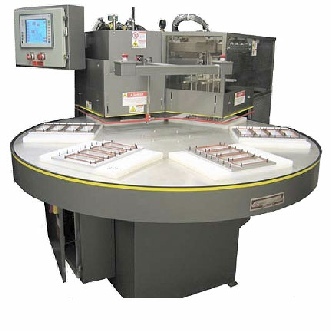 Automatic rotary blister and tray heat sealer for blister packs, medical or pharmaceutical tray packages. 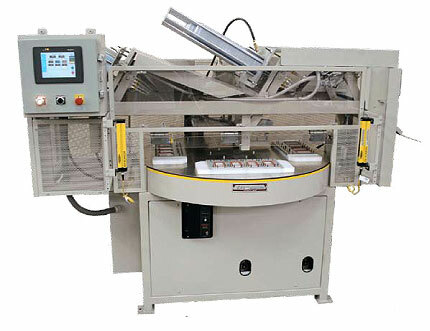 An automatic blister and card feeder and product unload -package ejector. Touch screen operator interfaced panel. PLC controlled. Blisters automatically placed into nests. Automatically places cards on top of the seal tools. Automatically removes sealed product.